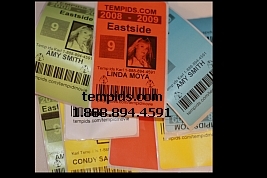 If you are looking for parking pass and parking permits to affix to the vehicle then tempids.com can assist you. The parking permits can be printed with up to six colors with no charge for consecutive numbering. Choose from our 10 standard ink colors: black, yellow, red, orange, reflex blue, process blue, purple, burgundy, brown, and green and your choice of seven materials: white vinyl, clear polyester, white polyester, brite silver polyester, brushed silver polyester, or gold polyester. Our parking passes are available in the following shapes: rectangle, square, circle, and oval. Schools, Condiminium and Apartment Complexes use the parking passes. Equipment managers also use these labels for inventory management. Security can easily identify valid parking passes from tempids.com. Parking violators won't get by your parking police. 1 3/4 x 1 3/4"
1 7/8 x 2 7/8"
Included in the price: choice of 10 standard ink colors, choice of one of the7 materials, free set up, modifying your art, borders, reverse printing, consecutive numbers, and lamination, your logo or mascot, and school year or calendar year. Serving your Parking Control Security Needs -- TempIDs.com.